Bannon Park Classic to commence Thurs. 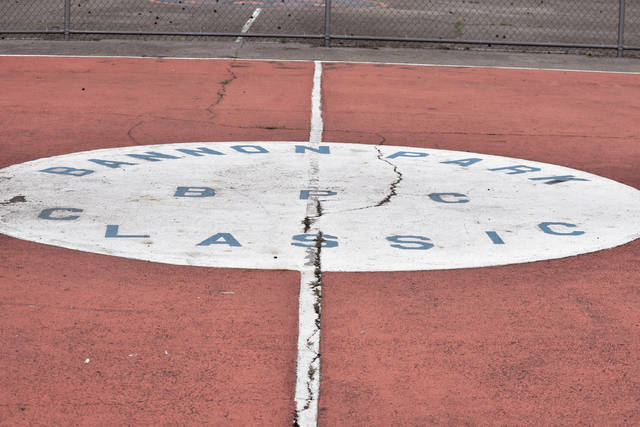 The center of the Bannon Park Classic court, which sits just off of 14th Street and Robinson Avenue in Portsmouth. Over the past four decades, the Jeff Lisath Bannon Park Classic has featured some of the brightest basketball talents around Scioto County, the Tri-State Area, and the State of Ohio in general. Need proof? Basketball standouts such as Craig Tubbs, Corey Allison, and heck, even former Ohio State one-and-done standout and 2009 NBA Draft first round draft choice Byron Mullins, have all taken part in the Bannon Park Classic at one time or another. So it only stands to reason that the dedicated event would be back for yet another go in 2018. From Thursday through Sunday, the Bannon Park Classic, in its 40th consecutive version, will be back with its normal five-on-five, full-court experience and will showcase five different divisions that will feature individuals from fifth grade on up through adulthood — which combines the hopefulness of the youth in attendance with the experience and know-how of the adult players. For Bannon Park Classic Event Coordinator Gerald Gordon, the classic is truly one of the best collections of talent that one can hope to find around the Tri-State Area. The Jeff Lisath Bannon Park Classic, which started in 1979 as a 3-on-3 tournament on the strength of Lisath among others, is an area-renown tournament that routinely attracts top-area talent from the Tri-State Area boundaries to Dayton, Columbus, and even Cleveland, among additional cities. In addition to the talent that the Bannon Park Classic attracts, the format of the classic is such that it draws great talent, as the BPC plays to 22 points — or 15 minutes, whichever comes first — before taking a halftime break, then resuming play for a second half until a unit reaches 44 points — or if the final 15 minutes of action concludes first. Vendors and music will also be available at the event. That format, which is similar to, but doesn’t exactly follow the BIG 3 League that hip hop, rap mogul, and movie star Ice Cube founded last season, will be in place throughout the classic. Each of the divisions — fifth and sixth grades, seventh and eighth grades, high school, adults, and the O.G. League, the latter of which consists of basketball players that are of 35 years of age or older — will play in a format that consists of 5-on-5 double-elimination tournaments. And what’s even better? If weather disrupts the primary location of the event off of 14th Street and Robinson Avenue, the staff involved with the Bannon Park Classic has a backup plan already in place in the Old PHS Gym, which is, like the basketball court at 14th and Robinson, a very popular gym among local basketball aficionados. If nothing else, however, the individuals that will be playing basketball from Thursday through Sunday will be shining a clear light for those hopefuls that could very well be playing at Bannon Park, and possibly beyond, in the future. And there’s always a place for an event like that in Scioto County and the Portsmouth area. According to the Bannon Park Classic Facebook page, individuals that are passing to the fifth and sixth grades will kick things off on Thursday morning, while individuals that are passing to the seventh and eighth grades will start Friday morning. The high school-aged competitors will play under the lights on Friday evening before each of those three divisions begin championship play on Saturday morning. The adult divisions then cap off play by starting their respective tournaments on Saturday afternoon before ending it with the championship rounds on Sunday afternoon. Winners will receive t-shirts and trophies or medals in the lower divisions, while the winner of the adult division will collect a winner-take-all cash prize of $1,500. For more details, email Jeff Lisath at jefflisath@yahoo.com.